Moschops skull, showing areas of pachyostosis and distribution of forces in hypothetical head-butting combat. From Barghusen 1975). The Tapinocephalidae were an advanced family of giant herbivorous Dinocephalia, with an adult weight from about 500 to 1000 kg -- possibly up to 1.5 or 2 tonnes in the largest forms, such as Tapinocephalus atherstonsi. They are known from both Russia and South Africa. In all probability, the Tapinocephalidae had a worldwide (Pangean) distribution. The trend towards gigantism, so typical of many of the dinocephalians, was characteristic of even the earliest known members of this family. Along with pareiasaurs, these were the "heavies" of the Middle Permian. They flourished briefly during the Wordian and Capitanian ages, radiating into several lineages, existing simultaneously, and differing mainly in details of the skull and, to an even lesser degree, the skeleton. It is not clear how such similar animals could each find their own ecological niche, but such was obviously the case. There is a parallel here with the hadrosaur and ceratopsian dinosaurs of the Late Cretaceous. The cause of their abrupt extinction is not clear, since other smaller animals, and even the pareiasaurs, were not affected. Quite probably, like the extinction of the late Pleistocene megafauna, a number of factors were involved. The tapinocephalid skull is massively constructed, and either long-snouted (e.g. Struthiocephalus) or high and short (e.g. Moschops). Very often the top of the head is rounded, and the bones of the forehead are elevated into a sort of dome or boss, in the middle of which is a large pineal opening. In some specimens this boss is of only moderate thickness, while in others it has become greatly thickened into a huge mass of bone (pachyostosis). It has been suggested that these animals engaged in intra-specific head-butting behavior, presumably for territory or mates. A similar thickening of the skull occurs in pachycephalosaurian "boneheaded") dinosaurs, and it is speculated that all of these animals practiced head-butting behavior like modern goats and bighorn sheep, or Late Eocene titanotheres. In keeping with their vegetarian lifestyle, the chisel-edged teeth are undifferentiated, lacking canines, and rather peg-like. In maturity the teeth have a talon and a crushing heel and the upper and lower teeth of the whole battery intermesh. 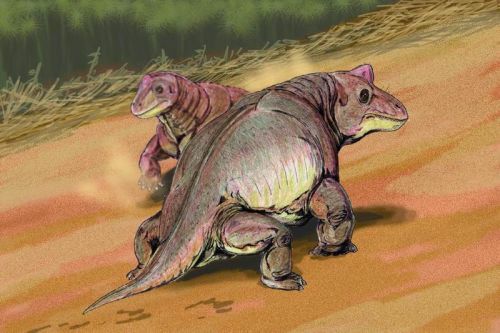 The limbs are heavy, with sturdy forelegs that sprawled out to the sides, while the longer hind legs were placed directly under the hips (the dicynodonts had the same posture). The feet are broad and short. There is some disagreement over whether these animals lived in dry upland environments (Colbert), swamps, or either, depending on the species or tribe. There is no doubt that the Tapinocephalidae occupied different ecological niches. However, the tendency of earlier writers like Gregory 1926) and Boonstra (1965) to consider them semi-aquatic wallowers is reminiscent of the old fable of the sauropods consigned to the swamps because their limbs were too clumsy and their bodies too heavy for them to exist on dry land. In fact, if they were head-butters, it is unlikely they could have been clumsy swamp wallowers, since head-butting implies some degree of mobility. Boonstra suggests that form such as Tapinocephalus and Struthiocephalus were semi-aquatic, while Moschops was terrestrial. It is quite likely that some tapinocephalid species may have frequented pond margins, feeding on soft vegetation, others preferred dry uplands. Gregory (1926) considered that dinocephalians were aquatic animals, the wide hands and feet and the extensive fore and aft reach being useful for propelling the animal through water and the massive forehead being an advantage in diving. He suggested that the pineal organ might have been phototropic, helping the animal to orient itself relative to the surface of the water. Tapinocephalines were seen by Boonstra 1956) as semi-aquatic animals. The cumbersome body, poor locomotor apparatus and feeble lower jaw and massive cranium all suggested to him that these animals could not have fed efficiently on land on tough vegetation. Instead he presented them as wallowers, being buoyed up by water, feeding on soft marsh vegetation. Rescuing the tapinocephalids from a life of diluvian swamp-wallowing, Bakker (1975, 1986) argued that bone histology, geographic distribution, and predator-prey relationships showed that these were active, fully terrestrial and at least partially endothermic animals, midway between the ectothermic pelycosaurs and the fully endothermic theriodonts. Others like McNab and Geist suggest that the tapinocephalids were better considered inertial homeotherms, with the large barrel-like body and short tail being the most efficient surface for conserving heat. My own position, for what it is worth, is that these were all fully or at least mostly terrestrial animals, although possibly (but not necessarily) evolving from semi-aquatic ancestors (many of the Russian dinocephalians seem to have lived a semi-aquatic lifestyle). They were inertial homeotherms, not endotherms, and rather than the ungainly antediluvian bumblers, were well adapted, successful animals that dominated their environment. Their demise was the result of a sudden environmental stress, perhaps a combination of climatic and vegetation change and exotic disease, which naturally hit these big, K-selected (slow to reproduce) creatures hardest. MAK020416. Phylogeny: Tapinocephalia:: Titanosuchidae + *: Ulemosaurus + Tapinocaninus + (Struthiocephalus + Tapinocephalus + Keratocephalus + Moschops + Riebeeckosaurus). Characters: extensive cranial pachyostosis, with reduction in size of temporal fenestrae [BS00]; pineal boss normally massive; jaw hinge displaced forward [BS00]; incisors with well-developed heels [BS00]; canines reduced [BS00]; teeth interdigitate [BS00]. Links: for once, we are more or less in complete agreement with the Mikko's phylogeny. Unfortunately, there is little else on the web worth mention. Most sites seem to be devoted to one of the particular members of this outstandingly ugly taxon, usually Moschps or Ulemosaurus. References: Battail & Surkov (2000) [BS00]. ATW050930. Range: Late Permian of Russia. Kamennyi Valley, near Isheevo, Perm region. Isheevo Dinocephalian Complex, Lower Tatarian Substage, Middle(?!) Permian ("Zone II"). 3 skulls. Postcrania also known. Phylogeny: Tapinocephalidae: Tapinocaninus + (Struthiocephalus + Tapinocephalus + Keratocephalus + Moschops + Riebeeckosaurus) + *. Characters: very large form [BS00]; snout narrow & tapering [BS00]; skull wide and very tall in postorbital region [BS00]; thick cranial roof [BS00]; dorsal border of roof strongly pachyostosed [BS00]; broad postorbital bar [BS00]; temporal opening relatively large [BS00]; incisors large [BS00]; canines of medium size [BS00]; anterior postcanines much larger than posterior postcanines [BS00]. Comments: This genus was originally taken for Moschops or perhaps a near relative. Boonstra 1963). It is now regarded as a considerably more basal form. Links: Gondwona Studios; Ulemosaurus; PERMIANO terapsídeos 1. References: Battail & Surkov (2000) [BS00]; Boonstra (1963). ATW020526. Range: Middle Permian of South Africa. Eodicynodon Zone, Karoo deposits, Beaufort series. Wordian Age. Tapinocephalidae: Ulemosaurus + (Struthiocephalus + Tapinocephalus + Keratocephalus + Moschops + Riebeeckosaurus) + *. Characters: very large (3 m & 1000 kg). Links: NAPC Abstracts, Ra - Ru; BPI Palaeontology (Wits University; University of the Witwatersrand, Johannesburg); paleontology; fossils; South Africa; therapsid2b; Albany Museum -- Karoo Fossils. ATW020526. Struthiocephalus: S. whaitsi Haughton, 1915a. Range: Middle Permian of South Africa. Tapinocephalus Zone, Karoo deposits, Lower Beaufort Beds; Beaufort West. Phylogeny: Tapinocephalidae:: Tapinocephalus + Keratocephalus + Moschops + Riebeeckosaurus + *. Characters: Fairly strong snout; moderate pachyostosis; "male" morph with large naso-frontal boss; perhaps 3m & 1000 kg. Comments: Brink (1956) suggests that Struthiocephalus fed in or near water, the teeth being used for rooting up, gathering and grasping plant matter. Boonstra (1965) likewise considered that Struthiocephalus fed on soft vegetation, possibly under water. He suggested the postcranial skeleton possibly showed adaptations to living in marshy conditions (but see comments above), and the bone surface around the nostril might indicate the presence of a fleshy valve present used for closing off the nostril under water. The long-snouted Struthiocephalus whaitsi would seem to be the only genus and species of this taxon. This animal has the largest head of any tapinocephalid. There area large number of synonyms. Struthiocephalellus is apparently a juvenile of Struthiocephalus. Boonstra showed that the seven named species of Struthiocephalus represent a growth series and are hence synonyms of the first described species, whaitsi. Of the remaining two monospecific genera, Struthionops intermedius known from a single skull, possesses a naso-frontal boss moderate pachyostosis and a fairly short snout. Possibly this is a variant of another species. On the basis of the shorter snout, King (1988) includes this species among the Tapinocephalini. The remaining species Moschosaurus longiceps, Haughton is known from a single small and lightly built skull about 25 cm. long from the Upper Tapinocephalus Zone. It was originally placed in its own family, the Moschosauridae, and considered a good ancestral or primitive form (despite its late date). However, Boonstra (1969) identifies it as a juvenile Struthiocephalus. Links: Albany Museum -- Karoo Fossils. Image: Struthiocephalus skulls It is likely there is only one species, Struthiocephalus whaitsi. Struthiocephalus (A) probably represents the male form, Struthiocephaloides B) the female. Illustration from Boonstra (1969). Phylogeny: Tapinocephalidae: Struthiocephalus + Keratocephalus + Moschops + Riebeeckosaurus + *. Characters: over 3m & 1500 kg; adult skull 45 cm; short weak Moschops-like snout., heavily pachyostotic skull roof; massive bony frontals. Comments: Tapinocephalus atherstonei is the only species of this genus. It is known from a number of skulls and postcranial bones. The skull is large with a heavily pachyostotic skull roof, a massive bony frontals and a short weak Moschops-like snout. Taurops is a synonym. This successful animal survived right until the end of the Tapinocephalus zone. Phocosaurus megischion differs from Tapinocephalus only in that the transition from the frontals to the snout is not abrupt. In view of the fact that it too continues until the upper Tapinocephalus zone, I would tend to see this as synonymous with Tapinocephalus zone, the differences being sexually dimorphic. Links: South African Museum - Fossil Reptiles of the South African Karoo; NAPC Abstracts, Ra - Ru; ALBANY MUSEUM - KAROO FOSSILS. 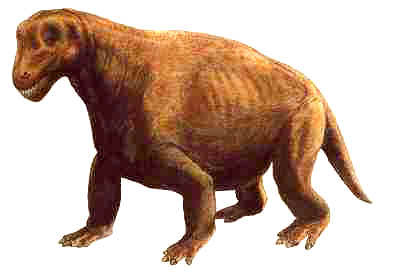 (images in a sort of American Primitive style); therapsid2b good, non- technical species account). ATW030730, MAK020416. Range: Middle Permian of South Africa. Lower and Middle Tapinocephalus Zone, Karoo deposits, Lower Beaufort Beds; Beaufort West. Phylogeny: Tapinocephalidae:: Struthiocephalus + Tapinocephalus + Moschops + Riebeeckosaurus + *. Characters: 2.5 to 3 m long (skull 50 cm); 700 to 1000 kg; variable snout length; variable pachyostosis; nasofrontal boss raised into horn-like shape; . Comments: Keratocephalus moloch, known from a number of greatly variable skulls, along with postcrania, from the Lower and Middle Tapinocephalus zone, shows considerable variability in the pachyostotic development. It may be not as derived as Tapinocephalus. The naso-frontal boss is raised into a sort of horn (hence the name - "horned head") and the length of the snout varies greatly. This in itself throws doubt on Boonstra's distinction between short and long-snouted forms. Pelosuchus, known only on the basis of postcranial features, is a synonym. ATW020525 MAK020416. Range: Middle Permian of South Africa. Lower Tapinocephalus Zone, Karoo deposits, Lower Beaufort Beds; Beaufort West. Phylogeny: Tapinocephalidae:: Struthiocephalus + Tapinocephalus + Keratocephalus + Riebeeckosaurus + *. Characters: 2.5-5.0 m; skull very strongly pachyostosed; temporal fenestra strongly reduced; jaws short; marginal teeth chisel-shaped; front limbs sprawling, but rear limbs may have been columnar; tail very short. Links: Moschops; Moschops Printout - Enchanted Learning Software; Paleontology and Geology Glossary: Mo; Dinosaurios Spanish); Moschops, an early herbivorous therapsid; PANGEA Italian); LPermian.html; South African Museum - Fossil Reptiles of the South African Karoo; Moschops basic data and some small images); [모스콥스(Moschops)] (Korean); Moschops (Portuguese); Moschops - Dinocephalian Head Butting the Therapsids site, always a good bet). Comments: Moschops (with synonyms Moschoides, Agnosaurus, Moschognathus and Pnigalion) is distinguished by a strongly pachyostosed skull with a broad intertemporal region and greatly reduced temporal fossae. There are two species - capensis and koupensis - that are known from good material, and two species - whaitsi and oweni - of doubtful validity. It may be that M. capensis and M. koupensis are not distinct species at all, but gender morphs, and in any case they occupy the same stratigraphic range. The species Delphinognathus conocephalus, known from a single weathered skull, has a conical boss on the parietal surrounding the pineal foramen, and exhibits moderate pachyostosis. Boonstra suggests this may simply be a young specimen of Moschops; if so, Moschops becomes a junior synonym. Avenantia kruuvleieusis is only moderately pachyostosed, with a narrow intertemporal region and large temporal fossa. This apparently aberrant form may simply be a juvenile of Moschops. ATW031020 MAK020416. Riebeeckosaurus: R. longirostris Boonstra 1952b. Range: Middle Permian of South Africa. Middle Tapinocephalus Zone, Karoo deposits, Lower Beaufort Beds; Beaufort West. Phylogeny: Tapinocephalidae:: Struthiocephalus + Tapinocephalus + Keratocephalus + Moschops + *. Characters: Medium-sized (2.5 m est. 500 kg); very long, slender snout; narrow intertemporal region with narrow sagittal crest. Comments: Two skulls are known, both from the Tapinocephalus Zone. ATW020525 MAK020416.